The popular TV programme, Surgeons: At the Edge of Life, is returning to our screens this week. The programme follows surgeons at the Queen Elizabeth Hospital Birmingham, giving viewers a unique chance to look behind the scenes of the operating theatres and learn more about what is scientifically possible in modern medicine. 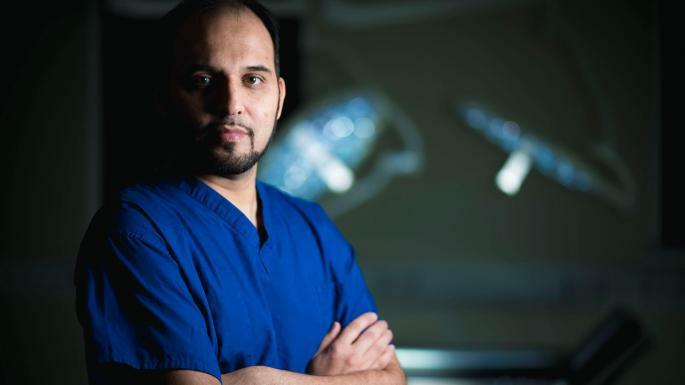 In the first episode, which airs on Tuesday 9 April at 9pm on BBC Two, the programme follows one of QEHB's top consultant neurosurgeons, Ismail Ughratdar as he performs brain surgery on 20-year-old Cameron. In order for Ismail to remove as much of the tumour as possible, Cameron is kept awake and talking throughout the procedure, known as an awake craniotomy. Watch a clip from the first episode of the series here. Cameron had just finished training to become an army medic when doctors discovered a tumour the size of a ping pong ball in his left frontal lobe. The procedure sees Cameron put to sleep whilst the team cut through his skull to access his brain, before he is woken up so that Ismail can tackle the tumour. Throughout the operation, a speech therapist gives Cameron word tasks, helping to guide Ismail away from the areas that he must avoid when removing the tumour. This cutting-edge procedure is just one example of the incredible surgery that takes place at QEHB, and will now be witnessed by millions of people around the country. Ismail appeared on BBC Breakfast to promote the programme, alongside Cameron, and said: “Complications within the surgery would have led Cameron to be paralysed down one side, or have speech problems. The episode also follows Jorge Mascaro, a Consultant Cardiac Surgeon who played an instrumental role in bringing Heart in a Box to the hospital. Jorge’s patient, 71-year-old Maggie has a weak aorta which is in danger of rupturing, which would be fatal for her. Jorge performs a thoracic-abdominal aortic aneurysm repair, considered one of the most extreme procedures that the human body can withstand, requiring the entire torso to be opened up along a huge incision. Cathryn Worth, Fundraising Manager at Queen Elizabeth Hospital Birmingham Charity, said: “We’re incredibly excited to see the new series of Surgeons: At the Edge of Life, and witness the incredible work of some of the world’s best surgeons right here in Birmingham. “The Charity is proud to support the works of the neurosurgery and cardiac surgery teams at the hospital, providing cutting-edge equipment that enables them to carry out new procedures, helping to save lives and change the way that we treat patients. You can find out more about The Giles’ Trust here. Surgeons: At the Edge of Life is on BBC Two at 9pm on Tuesday 9 April, find out more about the programme here.